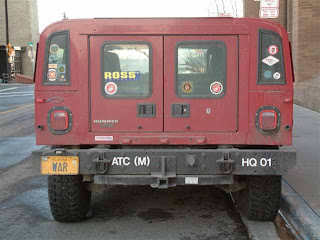 Wayne Anthony Ross, a gun rights advocate who blazes around town in a red Hummer with the personalized tag WAR, will step into the position vacated last month by Talis Colberg. The clever initials-as-actual-word usage is clever and eye-catching - especially on a Hummer. Most folks would never notice - but the plate people appreciate seeing a little bit of history on the road! Commemorative veterans' license plates will be part of the funding of an Alaskan Veterans Cemetary. The State House and State Senate are working on similar bills - more details to follow.